‪The chair of the U.S. Senate committee investigating a blast that leveled several city blocks of the small town of West, Texas, announced Thursday that the United States Department of Labor will cite the West Fertilizer Company for 24 major safety violations that led to the April 17 explosion at the plant. 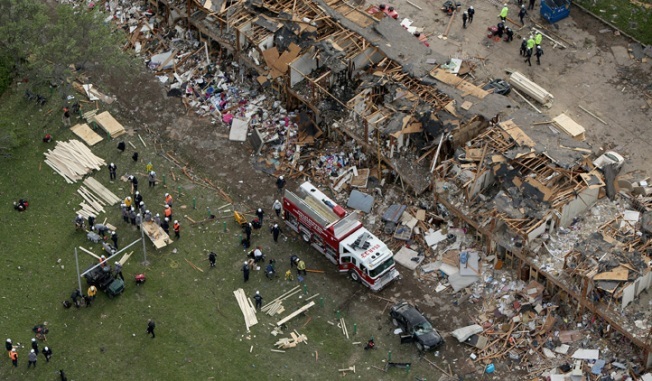 That explosion killed 15 people and destroyed homes in the area, causing millions of dollars in damage. The Occupational Safety and Health Administration has levied a $118,300 fine against the plant for the violations, which includes exposing workers to ammonium nitrate -- ammonium nitrate is the compound that is believed to have ignited and caused the explosion at the plant. OSHA violations include unsafe handling and storage of ammonium nitrate; misplaced labeling of tanks; failure to pressure test hoses; inadequate valves; lack of precautionary safety valves; failure to have emergency response plan; lack of fire extinguishers, and also a number of violations for lack of safety plans, Sen. Barbara Boxer (D-Calif.), the chairman of the Committee on Environment and Public Works, said during a conference call Thursday morning. After learning about the safety violations, Boxer described the West fertilizer plant as "an accident waiting to happen." The citations were issued on Wednesday, but due to the government shutdown the violations were not able to be revealed at that time. Boxer said she held the Thursday conference call to share the latest developments with members of the media. "I think this explosion should wake some people up," Boxer said during the call. "Right now, God forbid if there was another explosion somewhere. We have the Chemical Safety Board almost entirely on furlough, the EPA is more than 90-percent shutdown, OSHA is furloughed, even the Nuclear Regulatory Committee is mostly shut down." Boxer said further investigation is on hold due to the shutdown, but that all of the citations are for items authorities believe should be standard operating procedures in chemical plants. "I do think it’s important to ask the people, your senators for example, why they think shutting down the government is good for the people of Texas? And why it’s good that investigations have been stopped in their tracks? And how they feel about more inspectors?" Boxer said. In July, Boxer outlined her plan for the safer storage of ammonium nitrate following the deadly explosion in Texas. "I made a pledge to the families and I'm not going to stop until there are more protections in place to prevent chemical disasters like the one in West, Texas," Boxer said in July at a news conference. "There's a lot of things we can't control, you all know that, you can't control a lot of things. We can control this. You have the information, you know what has to be done and it has to be stored in a separate facility when it's present in such large quantities, and be protected from fire, and then people will be protected. It's not rocket science here."